Create at Your Own Pace! Students will also receive, via email, the address for the private class website page where the class pdf files, FAQ and comments and photos will be posted. 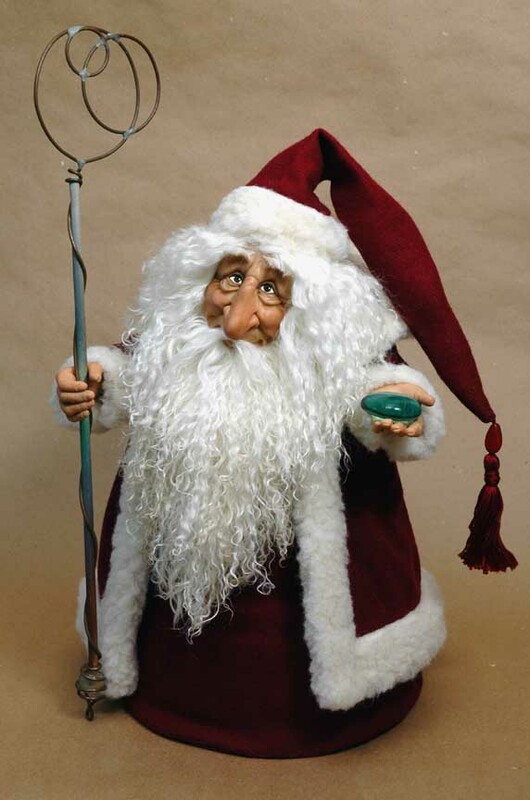 In this playshop we'll explore quick and easy ways to create Santa Claus and St. Nicholas figures using push molds, polymer clay, paper, wire, paint and fabric. Use the information to make one character or make a whole series in different sizes and in a variety of styles. 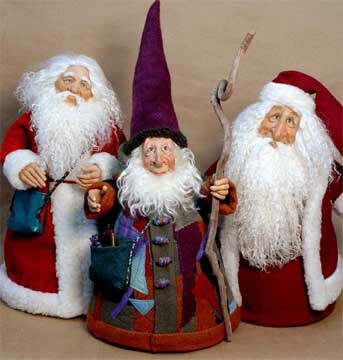 These are fun and friendly Santa designs, not labor intensive or detail perfect. Quick and easy patterns make these Santas and Elves a Do-in-a-Day projects! Well, that might be a slight exaggeration. Maybe a couple of days!!!!! 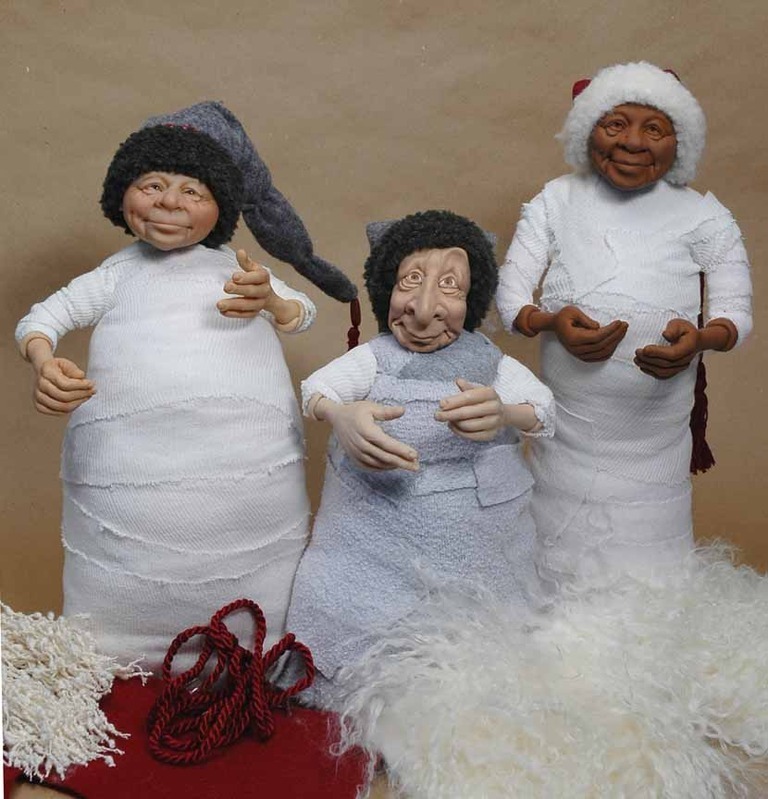 Finished sizes of the figures created in this class range from 10 inches to 24 inches tall. No two ever the same! Quick and easy patterns. You get to choose the type of Santa depicted and the size. 1. Do we have to use the What A Character Push Molds? Answer: No. Purchase of molds is not required. You can use your own molds or choose faces that you sculpt . In that case you would just use our techniques and patterns. 2. Which molds do you use in the class samples? 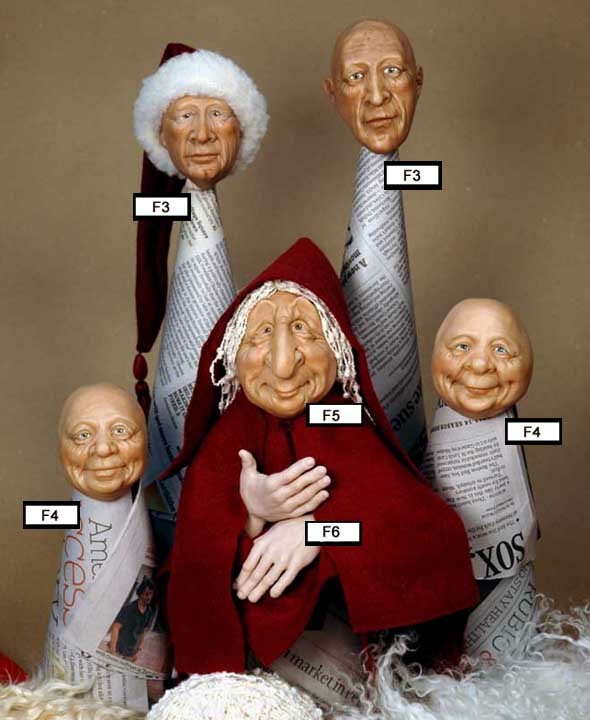 What a Character molds F3, F4 and/or F5 for the faces and F6 for the hands. If you want smaller hands, you can also use hand mold f10, which includes 2-inch and 1 3/4 inch hands. For slightly smaller characters, 9 inches to 12 inches tall, you might choose to use our molds F1 or F17 for the faces and hand mold f10. For the tiniest Santas, the even smaller hand mold f11 can be used. Of course you don't have to use more than one face mold as each mold can be tweaked to create a multitude of faces. If you're not familiar with these molds you can see them at http://www.weefolk.com/molds_list.htm . 1. Two DVD-s (computer or TV viewing) mailed to you, to watch as often and as long as you like. 3. 1 hour of our basic how-to public videos, titled "How To Use our 3-inch Face Mold" and "How to Use Our 2-part Hand Mold "
Register for the DVD version of the class via the links at the bottom of this page, by phone or via mail. NOTE: These two videos are also included on the DVDs as extras, for your convenience. To Register by mail, please use this printer friendly form. To Register on-line, click "Class Registration" below. and may not be reproduced in any way without expressed written permission.